Issue 15 (May - Jun 2004): Giant ALAMO Special! Alamo-specific figures from Conte, Britains, more. A review of the new Alamo books. Interviews with Frank Thompson who covered filming Disney's new Movie and a special section on Alamo Dioramas from collectors all over the country including the world's most accurate 25' foot long creation by Tom Feely and a miniaturized, brick-by-brick reconstruction of John Wayne's Alamo movie set! This one will have you gaping in amazement and delight. 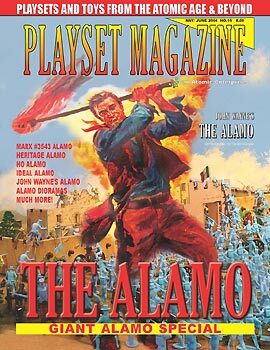 Frank Thompsons Making of the Alamo Movie book has beautiful coverage of the movie; his Alamo Novel is based on the screenplay. Get free shipping when you buy both from Frank direct - visit www.frankthompson.tv details. Don't miss another issue - subscribe today.